For August's Q&A sesh, I am featuring my good friend, Alice, whom I have known since our wee days of middle school. While our gastronomic adventures together didn't really begin until the past few years (both of us living in the city made that inevitable :P), we both have similar interests when it comes to the arts (music, literature, theatre, television, etc.). Going to concerts together (including Sara Bareilles and Joshua Radin), attending book signings for our favorite authors, discussing in depth the most recent novel we've read were bound to lead to a more formal setting to do such things (before/after/during). Whether it'll be grabbing a Vietnamese banh mi from Banh Mi Saigon, discussing when we'll make our own poutine, obsessing over the Morris Grilled Cheese Truck, or dreaming about the mozzarella from Torrisi Italian Specialties, I know Alice will be down for something delicious, casual or more formal. As with recommendations for a good read or for new bands/artists I may have never heard of, I can always count on Alice on having impeccable taste for something or some place good to eat. Thanks again to Alice for participating in this month's Q&A! 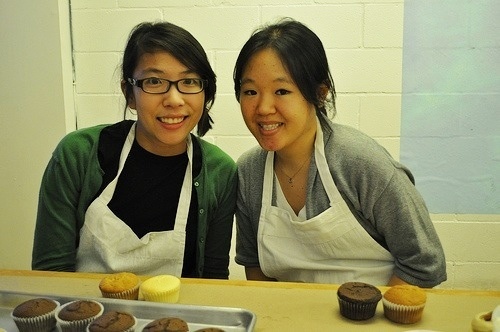 Alice and me taking a cupcake baking class at Butter Lane. I'm not able to pinpoint an all-time favorite but Nyonya, a Malaysian place in Little Italy, is my tried and true, best go-to restaurant. Recommended: roti, beef rendang, curry mixed veggies, and the tofu that's served with flames underneath (super helpful, I know). Dirty (or red-eye) chai: a chai latté with a shot of espresso, and it's the best. Iced or hot, you can't go wrong. Alcohol-wise, I love beer -- especially wheat beers and pale ales. When it comes to cocktails, I prefer gin: Pegu Club's Earl Grey martini and a simple but great mix of gin and guava are favorites. I hoard Crispy M&Ms. You can't find them in the states anymore, so I make friends buy them in giant bagfuls from European airports. Roasted tomato caprese salad: tomatoes, mozzarella, garlic, basil, olive oil, balsamic vinegar, salt, pepper, and sugar. Simple ingredients, but so good. A childhood dish: spaghetti with a mix of 2/3 Ragú and 1/3 white clam sauce, topped with shredded mozzarella. Growing up, this was my default meal whenever I was given a choice. I still love it. I've been lucky enough to travel (and eat) a lot, but I've never been to Japan. I'd love to visit Tokyo for the sashimi and ramen, and to check out all of the hole-in-the-wall restaurants. I don't actually have any culinary icons, but I can't get enough of Top Chef -- does that count? Bourdain is great, too. During a family trip, we had dong po rou -- Chinese braised pork belly -- in Hangzhou, China. From any other part of the world, it's usually just a bunch of pork fat but in Hangzhou, it was such good melt in your mouth deliciousness that we ordered several plates because we knew we'd never have it again. Blueberries are gross -- they remind me of fish eyeballs. Apple pie a la mode. With a giant side of whipped cream. Four Tines, of course. And Grub Street is great, too.